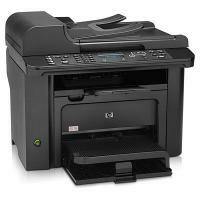 The HP Laserjet Pro M1536DNF MFP is a laser printer that is designed to meet the requirements of a small office and can also be used for personal use. It is a multifunction printer that can perform the combined operations of printing, scanning, copying and fax. The HP Laserjet Pro M1536DNF MFP is 14.7 inches in height, 17.4 inches in width and 13.5 inches in depth. It has an automatic document feeder having a capacity of 35 pages. This allows it to automatically scan the pages. It also has ePrint technology that allows it to print over the internet. Its main tray has a paper handling capacity of 250 sheets and the multipurpose tray has a capacity of 10 sheets. It has a duplexer for printing on both sides of the page. This printer can print at the rate of 7.5 pages per minute. The overall text quality and the quality of its photos is quite good. It can work over a network as well as a standalone machine. It offers an optical resolution up to 1200 dpi and can have 99 number of copies at the maximum. The HP Laserjet Pro M1536DNF MFP Toner Cartridges have a monthly duty cycle of 8,000 pages. The HP Laserjet Pro M1536DNF MFP is a laser multifunction printer that can print, scan, copy and fax and is suited to perform the needs of a small office or can be used for personal use. The HP Laserjet Pro M1536DNF MFP Toner Cartridges have a high duty cycle and the quality of the text and photos is good. But the problem with the printer is that its printing speed is quite slow. Q. Will my privacy remain protected, If I order HP Laserjet Pro M1536DNF MFP Toner Cartridges from this site? Q. What is the estimated price for the pack of 3 compatible HP Laserjet Pro M1536DNF MFP Toner Cartridges on this site? A. he price for the pack of 3 compatible HP Laserjet Pro M1536DNF MFP Toner Cartridges is €55.00 (Inc. VAT), which is much cheaper than the original brand. Q. I have few queries related to the HP Laserjet Pro M1536DNF MFP Toner Cartridges. Where can I contact you for that? A. If you have any queries, please call us on 048 3083 3221 or contact us on Live Chat or by email info@printerinkcartridges.ie, we will be happy to clarify your query. Q. Can you list the compatible HP Laserjet Pro M1536DNF MFP Toner Cartridges for the HP Laserjet Pro M1536DNF MFP printer which are available on your site? Q. Do I have to pay extra if I need my order on time? A. You will not be required to pay extra in case you want your order on time as our courier partner will manage to deliver your order within 1-2 business days or in most cases just next day of an order made. You only need to pay extra for the price of an item that includes the delivery charge, the same charge will be applied at the time of delivery. Q. Can you tell me the names of all the compatible cartridges for my printer? Q. What environmental benefits does this HP Laserjet Pro M1536DNF MFP printer provide? Q. I want to order the compatible cartridges for my HP Laserjet Pro M1536DNF MFP printer. Where can I find the serial number and model number of the product? A. The serial and product number for any model can be found on the back of the product. Q. What if the HP Laserjet Pro M1536DNF MFP Toner Cartridges I ordered for my printer does not work? Do you guarantee the supplies your offer? A. If you ordered the correct HP Laserjet Pro M1536DNF MFP Toner Cartridges and it fails to operate within the first 30 days of purchase then, you can contact our customer care or can email us. Our team will guide you through the process and your refund will be credited to your account. We offer 12 months guarantee from the date of purchase.